The Caring Cradle is a device that allows a dignified means for parents and families to spend more time with a baby who has passed. This support tool is for any family whose baby has died. In the past families were limited to morgue visits, packing a infant in ice, turning the temperature down in rooms and other antiquated means born out of necessity. Comfort Innovations is dedicated to providing families with a tool to allow an appropriate atmosphere to say goodbye to their baby. The Caring Cradle arrives complete, assembled and ready to assist staff and families. The bassinet and cart’s simple, modern design includes four easy glide, locking wheels that allow for quiet, secure set up and removal. The cooling mechanisms are stored securely in the hex locked section of the cabinet and is never visible to families. Set up for use is simple and requires no staff monitoring or management. We recommend the unit be plugged in for approximately 30 minutes before anticipated use. This allows the entire bassinet to reach the desired temperature. Once set up and plugged in the unit can operate for three days or longer depending on the families needs. 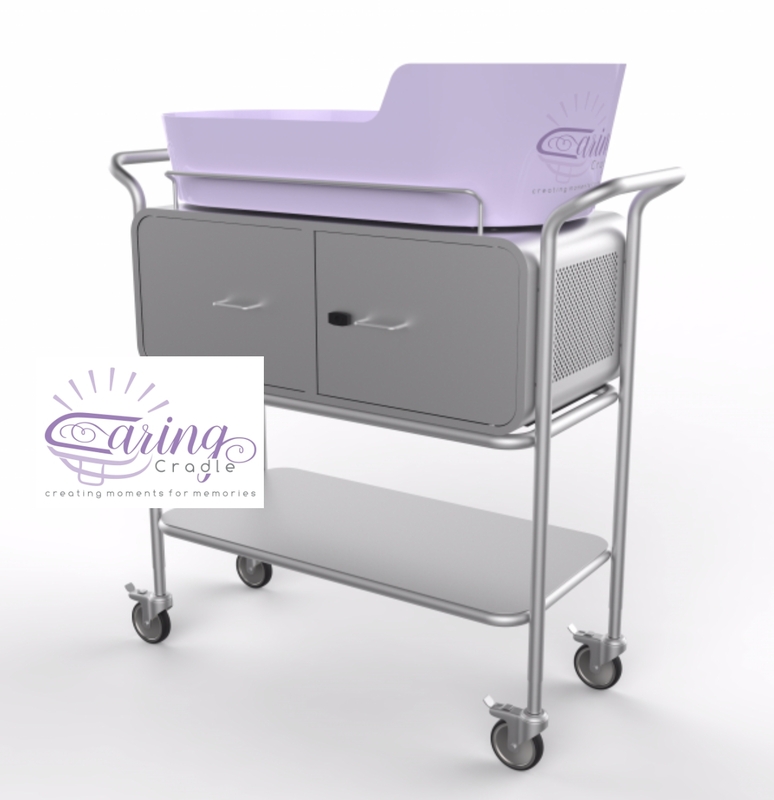 The Caring Cradle requires no staff monitoring, water, handling or disposing of harmful chemicals for use. No monitoring means staff has more time to focus on the really important things like caring for the families needs. The Caring Cradle operates between 43-49 degrees depending on the ambient temperature of the room. This temperature variation is adequate to preserve the appearance of the tiniest of babies..
"I only got 35 mins with my baby, so this would have been amazing for me." "It is a nice idea. Would it make it possible for the baby to stay in the room longer?" "I think it's fantastic. We were only allowed to hold our baby for a very short time, not able to get pictures or anything so anything that would make it possible for parents to spend a little extra time with their baby would be fantastic." Each Caring Cradle is equipped with the standard US, 3-pin, grounded power cord. However, Each unit has an inter-changeable adapter to accommodate any international requirements. Our cradles are designed with all non-pourous materials making them easy to sanitize between uses. The cart design features a powder coated metal finish and the bassinets is made of durable recycled vinyl with a plastic fill that allows the use of any commercial grade or bleach based cleaner. The Caring Cradle achieves temperature utilizing a small amount of environmentally safe coolant. The system is a closed, sealed system and does not require refilling, recharging or disposal of hazardous chemicals with each use. Since the Caring Cradle does not require monitoring once it is plugged in there are no alarms to distract families. Designed, Engineered & Assembled in the U.S.A.
Our cradle was designed and engineered by our manufacturer in Nashville TN. Each cradle is like wise assembled in the US. Should your cradle experience any function issues it will not require international shipping to be serviced. At Caring Cradle we know how important the bottom line is. Our device does not require any consumables for use, ever. At Caring Cradle we know how important the little things are. 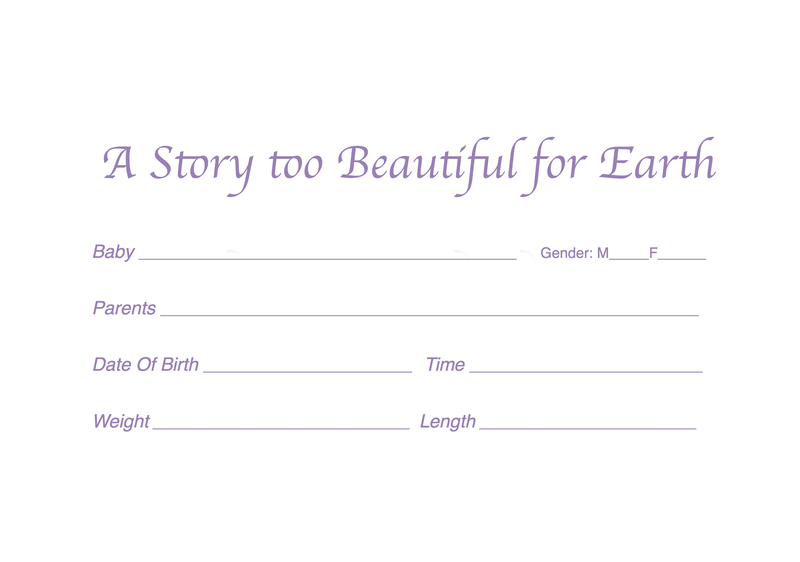 Each cradle will come with a supply of special birth announcement cards. Staff can write the details of baby's birth and slip the card into the holder affixed to each bassinet. These cards will make a treasured keepsake for parents to take home. Email comfortinnovationsllc@gmail.com for current pricing. "I would have been extremely grateful for anything that would have allowed me to spend more time with my miracle. The "what ifs" hurt the most. I dream of having spent more time with him." "Oh how much would I had liked to have had one of these. We held our daughter for as long as we could but she started to change. I felt so empty when they came and took her away."